When your son, whose teenage years are almost over, wants to move into a room in the attic (before moving out forever) you don’t say no. Of course, it means cleaning up there and sorting a lot of stuff you hoarded there over the years. That’s what we did last week. My son and I opened boxes with things he, me, we remembered. Also, things we thought to have already got rid of and things we had forgotten completely. There was a lot of reminiscing and talking. Funny for example to find my old exercised books from primary school. Very touching to hear him say that there is no way I should put that on the pile with things to throw away. Of course, we came across clothes: an old leather jacket, a Benetton jacket with large shoulder pads and a matching skirt in 100% wool I remember wearing for my first job interviews. And then, I found a pile of sweaters I handknitted in the 1980 and early 90ties. Last century stuff. Four pieces of many more I knitted when I was a student. Most of them during classes. Yes, there had been times where teachers would tolerate that. Somehow these survived. I stored my old handknits in my parent’s basement. Except these three all my handknit sweaters are gone. Perhaps my mom gave them to charity. Or they died when a water pipe burst and flooded everything. 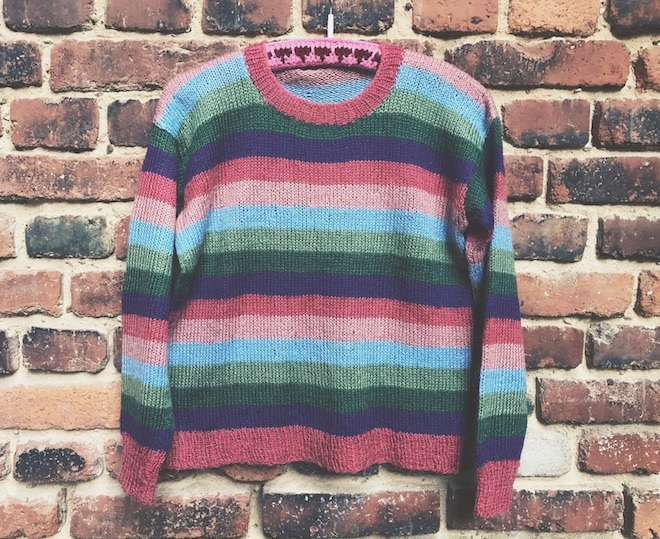 So, hello vintage sweaters from the past. Ugly oversized beasts with drop shoulders and wide sleeves. Without further ado, and without shame, here are the pictures of my 80ties handknits. The first I want to show you is a very special one: It is indeed the first sweater I ever knitted. I must have been 15 or so. The yarn is a mohair acrylic blend. It is knit in the round. My mother has tucked the seams, to make it a bit tighter. I remember that she wore it, too. She is a lot smaller than me. Hm, I will try to open the seams, wash and block it. I might want to wear this one. The next one is huge, just take a look. 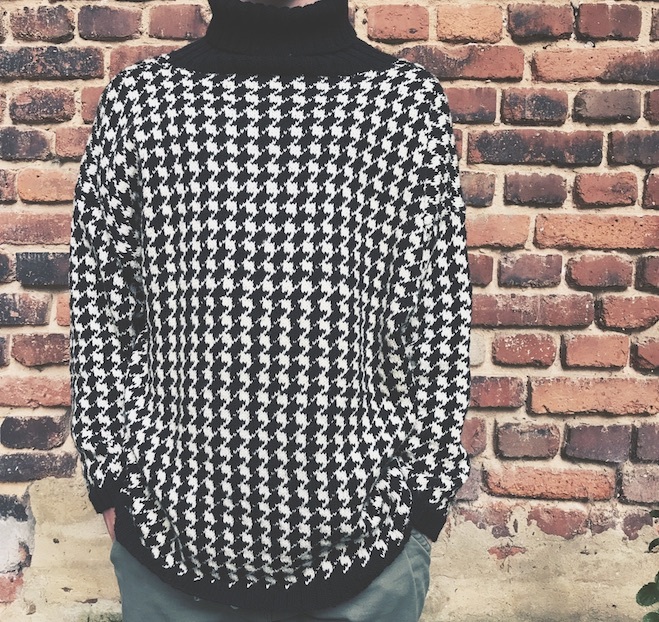 Stranded black and white houndstooth pattern with a turtleneck. 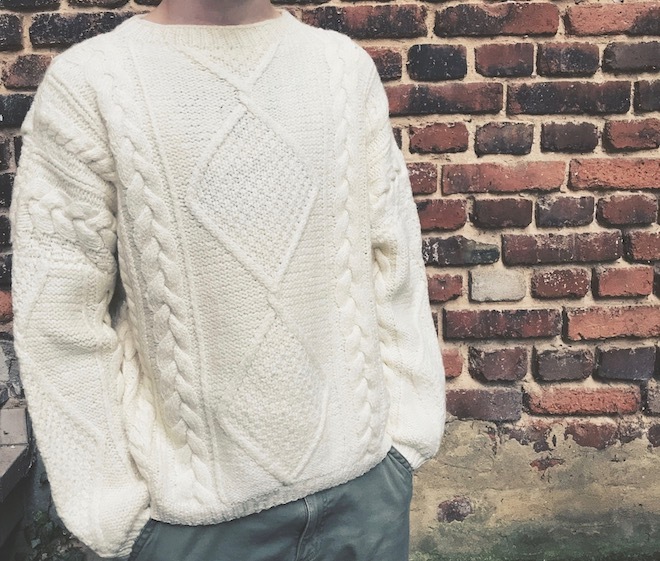 The sweater is worked in a sport weight yarn which resulted in a thick, dense fabric. it. I did wear it in really cold and snowy winters. The yarn is probably a wool-acrylic blend. And I am quite impressed by my colourwork skills. I only learned about colour dominance a few years ago, but it seems that I did it correct intuitively. I will pass on this one to my son. He has broader shoulders than me. The Aran below sweater has enormous sleeves, too. Geez, did we really like these in the last century? Or was it just a knitting fail? The yarn seems to contain a huge part of acrylic. What a pity, as otherwise, it would be a total wearable classic. It is a point that today I just can’t understand. So much work is going into a piece of knitwear, why bother with acrylic yarn instead of using wool. So that is my 80ties knitwear. Can you relate to this post? Do you have vintage treasures in your wardrobe? I would love to read your comments and see some of your works. No shame, check your closets, attics, basements for your old handknits. Share them with me: In the comments below, on Instagram or on my Facebook page. Hashtag: #80tiesknitwear.